China, 1878 to 1949 Mint and Used Collection, as received and housed in Minkus album, starting with good selection of large Dragons, #78, 80, 201, collection starts to fill in starting with the Junks up to 1949, plus Formosa Province, Sinkiang, Szechwan, Yunnan, French Offices, Japanese Occupation, Manchukuo and Russian Offices, a valuable and useful collection, generally Fine to Very Fine. China, 1888 to 1996 Mint Collection, housed in two Minkus albums, over 3,000 adhesives neatly mounted, light in 19th Century but noted # 13-15, 78, then fills in after 1930s, #1355-1358, Taiwan n.h. highly complete from 1955 to 1995, with some Offices, Provinces and Japanese Occupation, Fine to Very Fine. 2011 Scott approximately $6,600 (Owner's). China, Taiwan Mint and Used Collection, to 1970's, over 1,000 in stockbook, starting with #1012-24 mint with dupl. used, mint 1052-56, 1073-76 (2 sets), 1077-1091, after that mostly low value used sets with minor dupl., also hinged #1290-1307, 1355-58, Fine to Very Fine. 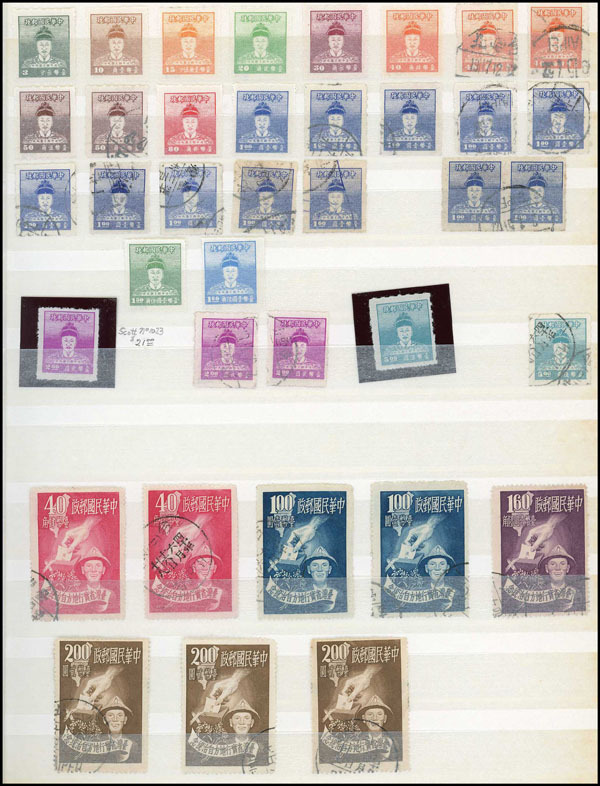 China, and Related Areas Accumulation, rather disorganized group of n.h. and used in 2 banker boxes with album pages, stockpages, glassine envelopes, year books, few covers, etc. of China incl. Imperial, PRC, Taiwan, Japan Occupation, Manchukuo, etc., with all period represented from older issues to modern, please look closely as there are many surprises here. China, Mint Stationery Stock, 571, mid to late 20th Century, all periods, identified mostly by Higgins & Gage and/or "EAPC" numbers, priced and sleeved, some dupl, strength in Aerogrammes, few PRC, mostly $5-$20 range, clean, taped with retail total $4,700. Ex. Friedman "Cover Corner" Stock. China, Taiwan, 1949 to 1983 Mostly Mint Collection, mostly n.h., from 1954 onward with some used prior, housed in Minkus album, noted #1041, 1114a, 1126a, 1355-1358, a useful collection, generally Fine to Very Fine. China, Estate Mint and Used Accumulation, few hundred, mostly 20th Century with Taiwan incl. 1956-1958 in presentation books, and PRC, in stockbook, stockpages, on album pages, etc., few FD's, later new issues, used in envelopes, etc., occasional better, inspect. China, 1885 to 1999 Used Collection, housed in Scott album, over 2,800 adhesives, noted #79, 124-130, Taiwan fairly complete 1955 to 1999, plus some Provinces, Treaty Ports Airs, Dues, generally Fine to Very Fine. 2011 Scott approximately $2,700 (Owner's). 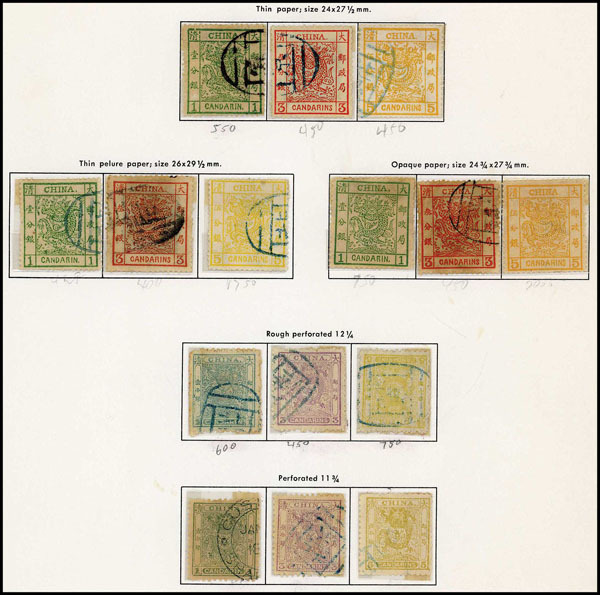 China, Republic Group, mint and used in four APS circuit books incl. sets and better singles, features Emperors set, various art sets, some German Offices and Manchukuo etc., neat assortment, generally Fine to Very Fine. 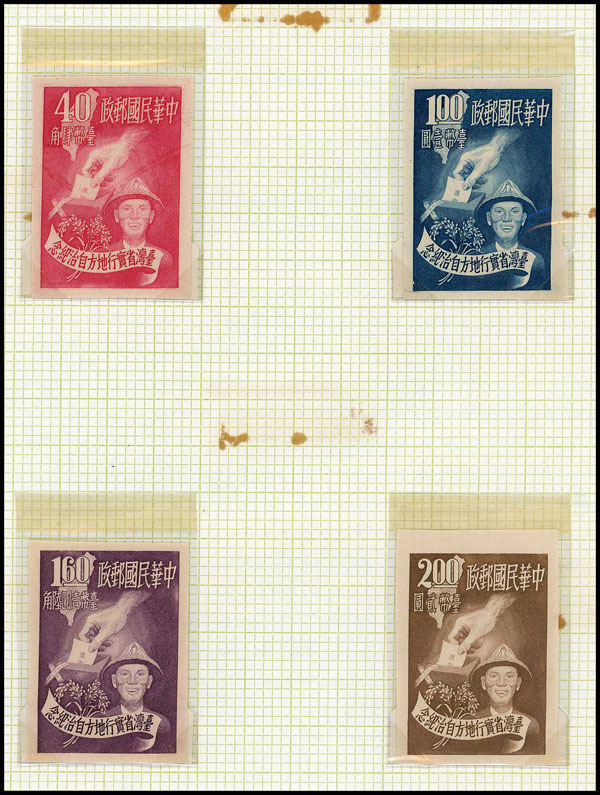 China, Republic and P.R.C., Mint and Used Collection, carton containing 5 albums and binders, P.R.C. 1983 to 2004, China 1994 to 2008, plus an album of earlier China mostly used, some dupl. throughout, a useful group, generally Fine to Very Fine. China, Empire and Taiwan Oldtime Collection, on homemade pages to 1961, Empire mostly used, also Provinces, Airpost, value in 1945 period on mint with #1037-40 perf and imperf, 1046-51 mint and used, also incl. some Manchukuo used, Fine to Very Fine lot. China, Japanese Occupation 1941 to 1945 Collection, on pages, all areas represented mint or used, reasonably complete, also Netherlands Indies Japanese Occupation, Fine to Very Fine. China, Commercial Cover Accumulation, 20th Century, both Empire, Taiwan, and PRC, some priced and sleeved, few Shanghai mint stationery, couple with U.S. adhesives, etc., needs a close look, Fine overall. Items that never got filed, Ex. Friedman "Cover Corner" Stock. China, 1950's to 2000 Collection, mostly mint collection in mounts on custom printed pages in binder, incl. both P.R.C. and Republic issues with great topical appeal, many complete sets, souvenir sheets throughout, generally fine to very fine, generally Fine to Very Fine. China, Local Post Collection, mostly mint, with selection from Amoy, Chefoo, Foochow, Kewkiang, Nanking, Wuhu, incl. Dues, generally Fine to Very Fine. 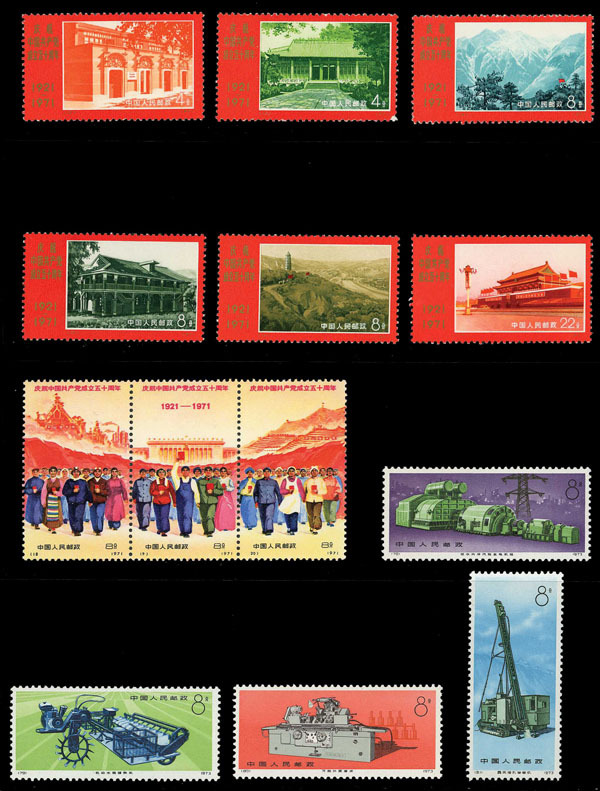 China (People's Republic), Mint Complete Sets, n.h., few incomplete values, selection from 1959 to early 1970's better sets incl. #1067-75 with folded #1074a, 1211-1214, Very Fine. 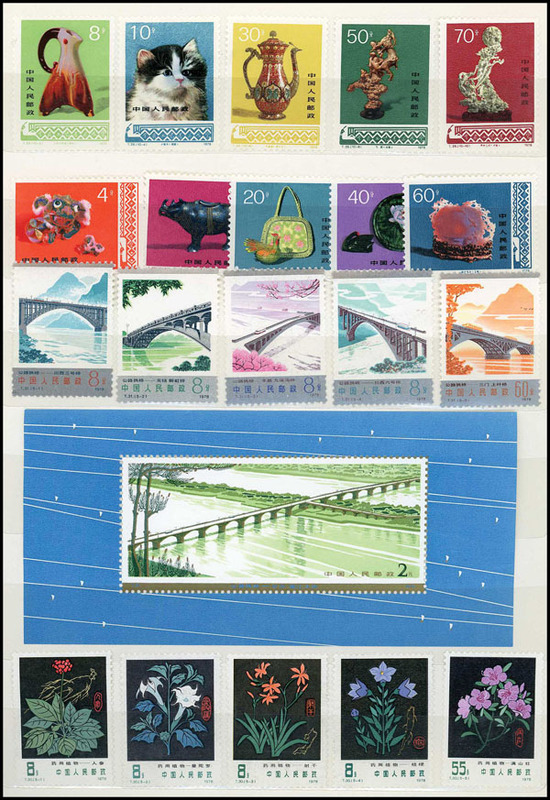 China (People's Republic), Modern Mint Accumulation, n.h., 1974 to 1981 sets and souvenir sheets in stockbook, no apparent dupl. incl. #1255-1270, 1452, 1483 and 1540, Very Fine. China (People's Republic), 1970's and Later Mint, n.h., incl. year sets, small stockbook cat. $1,000+, complete collection 1984-1995 (no sheetlets), etc., clean. 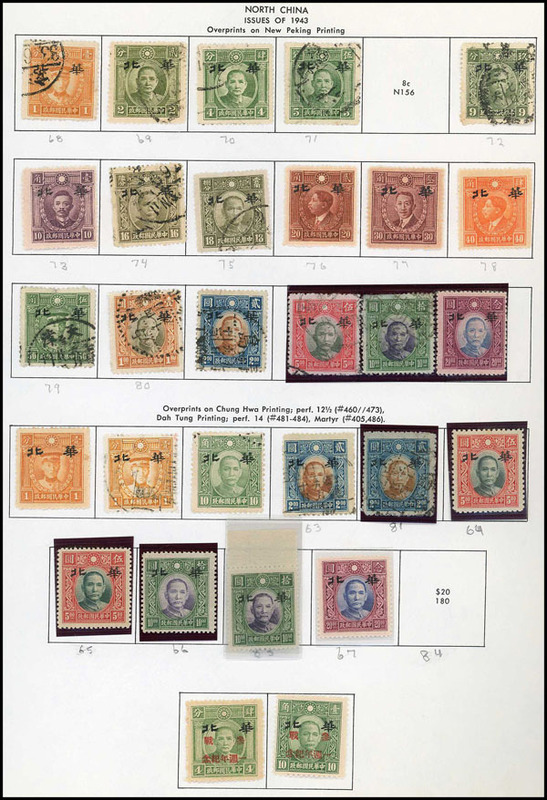 China (People's Republic), Never Hinged Stock, all on Hobby pages, complete sets, up to $40 cat., occasional used set or single value, clean, Fine to Very Fine. China (People's Republic), 1991 to 2011 Mint Collection, mounted on album pages, fairly complete, plus on stockcards (mostly used) selection of 1950's and 1960's, many reprints, also some early Imperial, inspection is recommended, mostly Fine to Very Fine. China (People's Republic), First Day Accumulation, few hundred mostly 1980's-90's sleeved and unsleeved in half full banker box, incl. press folder FD's, few Taiwan incl. #1776-83 set of 2, clean. Ex. Friedman "Cover Corner" Stock. China (People's Republic), 1981 to 1983 FDCs, 93 cacheted, unaddressed incl. #1844, Very Fine. China (People's Republic), 1982 to 2000's FDCs, couple hundred unaddressed, incl. souvenir sheets, mostly 1990's and later, #1785, 2008 Beijing Olympics complete, clean.